The Great Comic Book Cull Of 2010/2011 Part 44: Marvel Comics – Ghost Rider, Guardians Of The Galaxy, Great Lakes Avengers, Hercules, Heroes For Hire, and The Hood! Sounds like a formula for 1991 success: Put 3 of your most popular characters in a self-contained graphic novel, with Howard Mackie on scripts, and have John Romita, Jr do the art. I can’t say that this would go on my list of favourite stories from any of these characters, but it’s still a more than passable team-up, with art from a John Romita Jr. that’s at the top of his game. 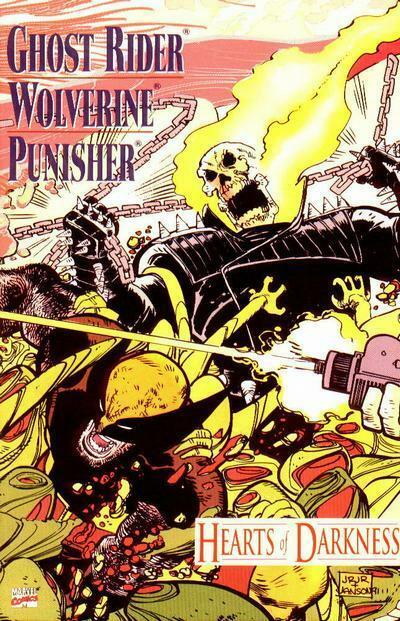 I also realized that this is the only Ghost Rider comic. I’ve never found the character particularly interesting. Any suggestions for arcs/runs that are worth my time? The Great Lakes Avengers is a little known Marvel concept that’s more of an in-joke than an actual viable super-team. They were originally created by John Byrne in the 90’s, and turn up periodically, mostly as comic relief. The only writer who was actually able to do anything viable with the characters was Dan Slott. Although this batch of mini-series and one-shots aren’t going to crack top 10 lists any time soon, they’re a nice mix of funny, and well, more funny. If you think the idea of a teenager whose power is the ability to talk to squirrels being the most powerful hero in the Marvel Universe is as hilarious as I do, these books are for you. The original Guardians were a 70’s/80’s Marvel team set in the future, that showed up from time to time in Avengers-related time mishaps. Despite a long running series in the early ’90’s, the concept never really took off, and so Dan Abnett & Andy Lanning borrowed the team name for their recent “Marvel Cosmic” comic events, and spun this new team out of those stories. This version is straight forward: A group of Marvel’s B and C level “space” misfit characters (Adam Warlock, space lesbians, a talking Racoon, and a talking Soviet-era Cosmodog) team up to save the universe from intergalactic threats. As they’re known to do. Although I like (I should say liked, since this was recently cancelled, which is par for the course with superhero books that I actually enjoy) this book, it’s hard for me to recommend it, unless you’ve read the other Marvel Space comics that Abnett & Lanning have been writing. The great thing about the space stories that these two have been writing is that you don’t need to be following most of what’s happening in the Marvel Universe to enjoy them. But you do need to be reading all of THEIR books in order to fully grasp what they’re trying to accomplish. It’s not that their stories are overly complicated, it’s that’s they think they’re overly complicated. Abnett & Lanning spend a lot of time needlessly explaining simple stories. It’s a relatively minor complaint though, and there’s more than enough to recommend this series. It’s character driven, as the best stories are. It’s a diverse cast, and because the writers have gone fishing through the Marvel backwaters for these characters, there isn’t the feeling of “Been There, Done That”, that is often felt in team books these days. Phyla and Moondragon, in one of the rare moments where one of them isn't dead. 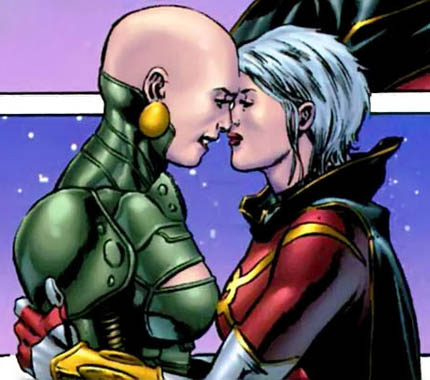 There’s a few subplots that became tiring quite quickly; namely the “will they, won’t they” nature of the relationship between Moondragon and Phyla Vell. Except in their case it was more of a “Will they actually manage to end an issue without one of them being horriblly killed” relationship. In the time that DnA wrote the characters, Moondragon was turned into an actual talking dragon, and then back to a human, then died, and then was brought back to life as a result of Phyla agreeing to become the avatar of death and killing Adam Warlock. But then Phyla was killed herself, except that she wasn’t really dead because one of her colleagues travelled back in time and stopped her before she could actually go through with it. But then she died again 5 minutes later. And then Moondragon became pregnant with a Lovecraftian space-god (Don’t judge, Republicans), and then found out that Phyla wasn’t really dead. But then Phyla brought Thanos back to life, and of course the first thing he did when he woke up was to kill her for real. Which is how she’s managed to stay for about a year, which means she’ll be coming back to life around the time I press “publish” on this post. It’s hard to take major character moments seriously if we’re not given time to digest them properly, and this book often moves a little too quickly for us to really fall in love with the cast. Still, it’s a fun, space adventure series with a big emphasis on humour that’s better than most of the stuff that Marvel’s putting out these days. I’m also not sure how Paul Pelletier isn’t one of the biggest artists in comics, as his work on this title is some of the finest I’ve seen on a superhero title in the last couple of years. This has been one of Marvel’s weirder success stories over the past couple of years. Hercules (yes, the god. No, not the one with the hammer. No, not the one on the cross. The super-strong one that gets laid all the time. No, not Charlie Sheen), has been part of the Marvel Universe since the late 1960’s, but has never risen above the role of second stringer. In a universe full of complicated characters, Hercules is painfully two-dimensional, and Marvel has long been content with portraying him as the drunken, fun-seeking lout. Until now. 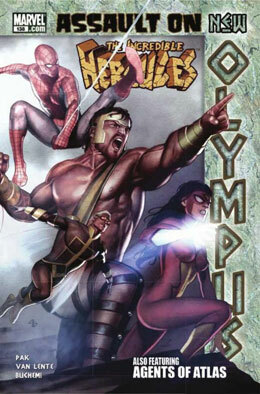 Both of the two big companies have been quite consistent in their attempts to use their bigger cross-over events to push lesser-known characters as of late, and that’s what Marvel did a couple of years ago with Hercules. They made him a major part of the major World War Hulk storyline, and went as far as renaming the Hulk’s ongoing series after him, and getting two of Marvel’s hottest up and coming writers to take it over. This was a delightful change of pace for those of us weary of Marvel’s recent doom and gloom. Greg Pak and Fred Van Lente took an uninteresting yet charismatic character, paired him with Amadeus Cho, a multi-faceted but slightly cold character, and let magic take it’s course. This is a 1980’s buddy movie, Marvel style. The two new friends bumble their way through the Marvel Universe comically, but the writers also make sure they give the two enough emotional complexity that by the series conclusion, we feel as we’ve been a journey with two old friends, not two former D-listers that we had forgotten about. This is the way you rebuild lesser known characters. To capitalize on the moderately successful Daughters Of The Dragon series, Marvel decided to dust off their old Heroes For Hire concept a few years ago. This one’s been kicking around the mid-70’s, and it’s one that is most often associated with Luke Cage and Iron Fist. 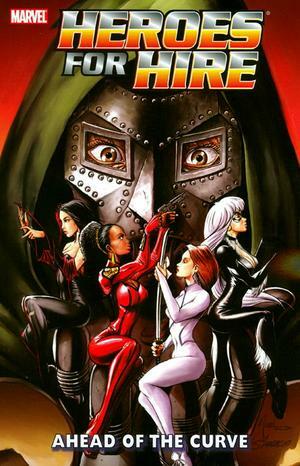 In this version, Misty Knight and Colleen Wing (The aforementioned Daughters), take the lead of this awkwardly grouped band of Marvel D-listers. Although I’ve always liked the concept, I had to force myself to finish rereading this. It’s poorly written, the plotting is all over the place, and the characters are barely likable. Thankfully the new version as written by Dan Abnett and Andy Lanning, more than make up for it, and I’m very much looking forward to collecting this new series in trade. It’s difficult to come up with new super characters that people will respond to. Although dozens of characters are added to the Marvel and DC universes every single year, almost none of them ever catch on with the general populace, and most are forgotten by the time the next writer takes over which ever book they were featured in. And so was the case with the Hood, at least for a while. 9 years ago, Brian Vaughan (of Y The Last Man, Ex Machina, and Runaways fame) wrote this unassuming little mini series about the origin of a super villain. 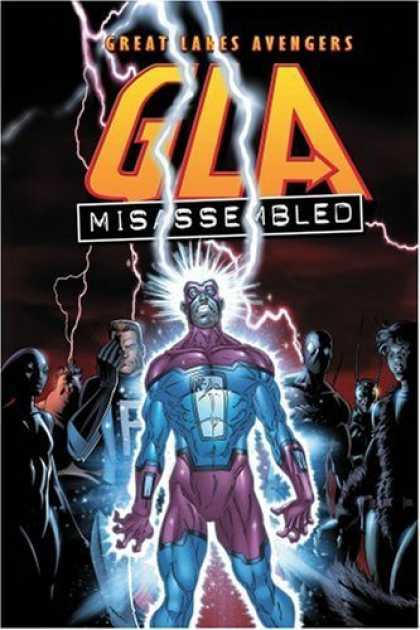 I loved it at the time, and although I had hopes that this would launch a new Marvel icon, the book went woefully unread, and the character was largely forgotten for the next 5 years. It wasn’t until Brian Michael Bendis dusted off the character and decided to turn him into the new Kingpin of Crime, that anyone really remembered the first series at all. The character endures today, and has become a major player in Marvel’s current continuity. But the new stories haven’t quite matched the original promise shown in this fantastic mini series. Parker Robbins is a low-level part-time criminal who is juggling a relationship with someone he’s losing interest in, the care of his invalid mother, and figuring out ways to pay for both. On a routine burglary, he accidentally kills a creepy alien/demon, and steals the cape and boots from its body. Voila, superpowers! And so Parker, with the help of his cousin Dave, decides to become a bona fide supervillain. There is success, but it comes at a steep price. Enjoying this will require almost no previous knowledge of Marvel Comics, as it’s a fairly realistic take on the superhero story, and one that actually humanizes the villains that we so love to hate. I’m not usually one to convince writers to go back to superhero comics. In fact, I’m usually the one trying to convince superhero writers to try something different. And while I’m more than happy to read anything Brian Vaughan does in the future, I’ll admit that a part of me would love nothing more than to read a monthly Hood series as written by Vaughan. Recommended. This entry was posted in Comic Books and tagged Brian K. Vaughan, Brian Michael Bendis, Fred Van Lente, Ghost Rider, Greg Pak, Guardians Of The Galaxy, Heroes For Hire, Incredible Hercules, Marvel, Punisher, The Hood, Wolverine. Bookmark the permalink.